If you are planning your first visit and want to know what to buy in Turkey, this post has you covered! I love wandering a bazaar or a souq or a gift shop to find the best thing to buy as a memento of my trip, especially if it is a unique Istanbul souvenir. 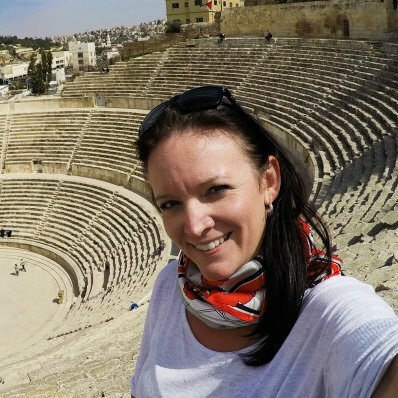 If you have read my post on what to buy in Egypt, you know that I am always on the hunt for something unique in my travels! And the kids love shopping too! I always let them pick out something to remind them of their travels, and Turkey was no exception! Turkish delight, locally known as “locum” has got to be one of the popular things to buy in Turkey. Even if you do not take it home as a souvenir, the Grand Bazaar in Istanbul has plenty of vendors offering sweet samples outside of their shops! My kids loved the mini gummy cubed style, but I prefer the flavourful nut-filled ones. If you are buying in bulk, you are likely able to negotiate quite a bit on the per kilo price! 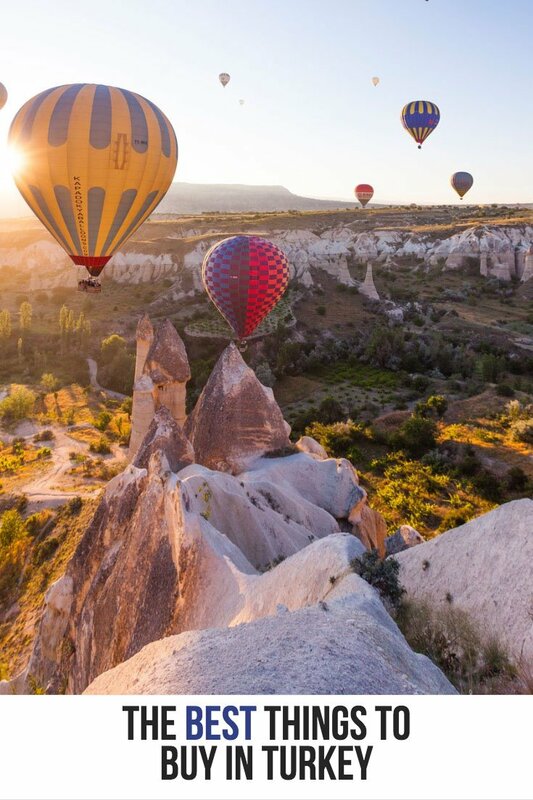 If you are looking for a taste of Turkey, but the locum is long gone, do not despair, you can get plenty online here. The Evil Eye is something you will see EVERYWHERE in Turkey. I think it is one of the must buys in Turkey as it makes a great visual reminder of your visit. 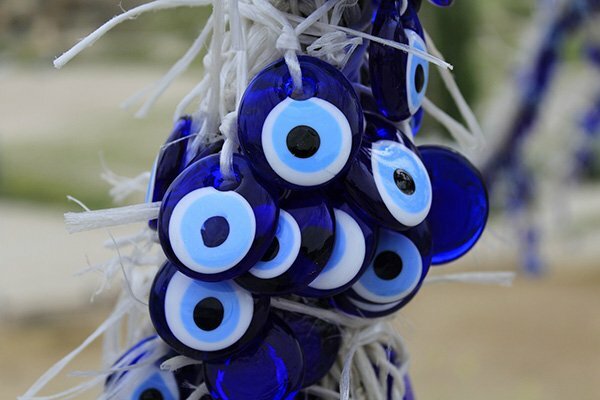 The Evil Eye is typically made from glass and circles or tear drop shapes in blue, white and black. You can pick these up almost anywhere in Turkey and in various sizes from bracelets to large wall hanging pieces. If you are looking for a small Turkish souvenir, this is my top suggestion! If you are looking to buy one online, check it out here. While you may not think of tea as one of the best souvenirs from Turkey, it is one that should not be overlooked! While in the Grand Bazaar, check out the aromatic flavours of teas in the shops. A popular one is Apple tea! You can get it in tea bags, but I also like the crystallized (sweetened) version that has dried apples and spices in it! This makes one of the great gifts from Istanbul to take home and share with your friends! You will also see plenty of vendors that sell the cute glass tea cups that are synonymous with tea in the region! If you are not in Turkey, but want to own your own style of glasses, check out these ones or these ones. Grab a box or two of Turkish Coffee when you visit! It makes a great Turkish souvenir for when you go back home! And it is great for sharing too! 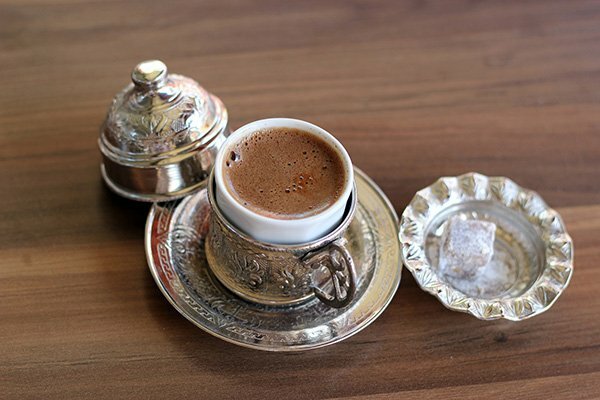 Turkish Coffee is not only something that you should try in Turkey, but also one of the things to buy in Turkey to take home to your friends and family! ( That is, after you ask how to properly prepare it! haha ). I take mine with lots of sugar and also bought a small turkish coffee pot to easily make it after I had returned home! Try it with and without cardamom to decide which one you prefer! If you are looking for my favorite Turkish coffee to buy online, check out this one. If you did not pick up a pot to brew your own Turkish coffee, check out one here or a traditional stove top style here. The Grand Bazaar is arguably the best place for shopping in Istanbul and is well known for its knock off merchandise. While some have said it has died down a lot, I sure noticed plenty of purses, shoes and clothing. While I was not looking for more “higher end” knock offs, you know, the ones that sell for almost a hundred bucks for the knock off version, I am sure they are there, just not in plain sight! One of the other really great things to buy in Istanbul is luggage! It is sooooooo cheap for hard case spinner luggage! So bring your old suitcase and take a nice new one home with you! A note about the Grand Bazaar: It is not always the “cheapest” place to buy things, but its labyrinth of stores, its indoor decor and the ambiance of street vendors is what makes it one of the best places to shop in Turkey. You will for sure be able to find what to buy in Turkey from the Grand Bazaar. You can read more tips for Turkey here. The bazaar’s in Turkey have an amazing array of spices making them one of the popular things to get in Turkey. But just like anything, you need to pay for the good stuff, so don’t be fooled by the cheap saffron. Opt for the better quality ones! A common sight outside coffee shops and in store fronts are tobacco pipes, known in Turkey as “nargile” pipes. 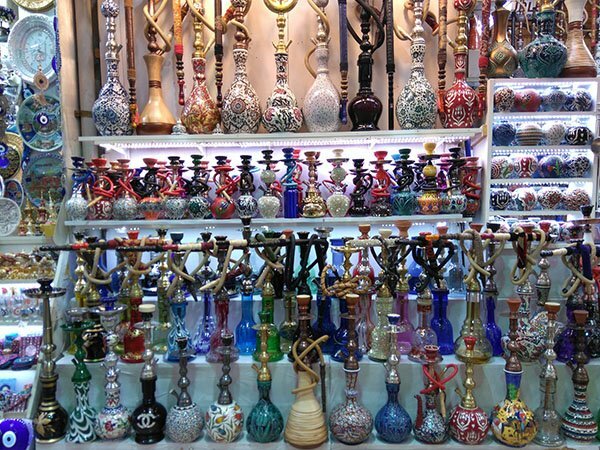 Whether they are “shisha” or “nargile” or “hookah” pipes, they come in many different shapes and sizes. Tourists often think these are one of the things to buy in Turkey that makes a great decorative souvenir back home. The hardest part about shopping for one of these in Turkey, is finding the luggage space to bring it back home with you! If you want to know what to buy in Istanbul, just take a few minutes to browse the Grand Bazaar for the beautiful mosaic lamps illuminating the shops. Various sizes are available; pay attention if they plug-in or are hardwired. Also make sure that when you make your purchase, they wrap it up well, you do not want a shattered lamp when you arrive home! We bought these tops in Istanbul for less than a few USD and they made the best plaything to keep them occupied! They would say it is the best thing to buy in Turkey if you have kids! 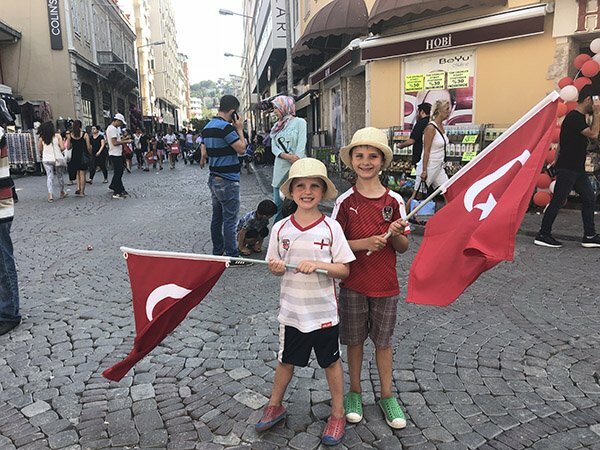 If you have kids in your life, one of the best things to buy in Istanbul is a top to bring home for the kids! My kids picked up one each on our first day for less than USD2 and they played with it every day on our trip! It was for sure a great value for money! The tough part for me is that there are DOZENS of kids selling these tops. 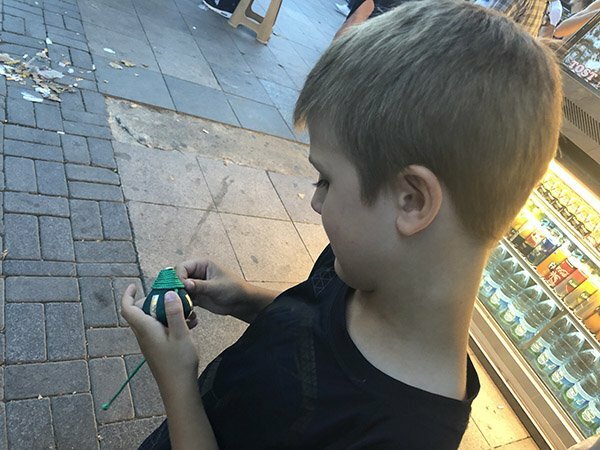 While I really try to stay away from buying things from children, this was one that I could not avoid as I never saw adults spinning the tops. I also found it to be a learning opportunity for my own children, that these kids have to help provide for their families, while my kids get to play after school! 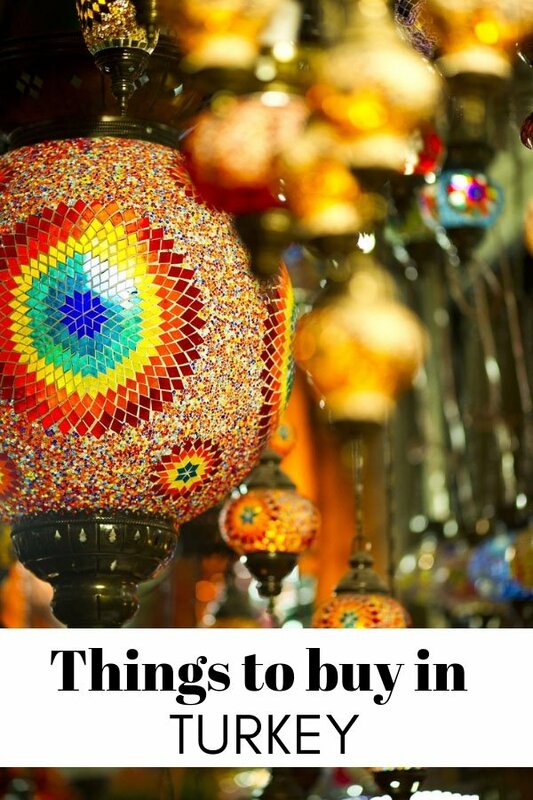 After reading this list of the best things to buy in Turkey I hope you have some souvenir shopping plans in mind. But if you are not actually going to Turkey and were looking to buy some Turkish souvenirs online, maybe for yourself, or maybe for friends or family you can find quite a few of these things here. Do you have any questions about visiting Turkey and shopping for things to buy in Turkey? Let me know in the comments below!